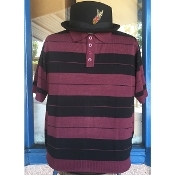 This is the latest version of the original Charlie Brown acrylic knit polo shirt. Greenspan's has been trying to get somebody to make these for over 5 years, and has now been successful. These Charlie Brown shirts were worn by OG's in L.A. and the Southwest. in burgundy/black, by Lowriderothing or Dyse One.